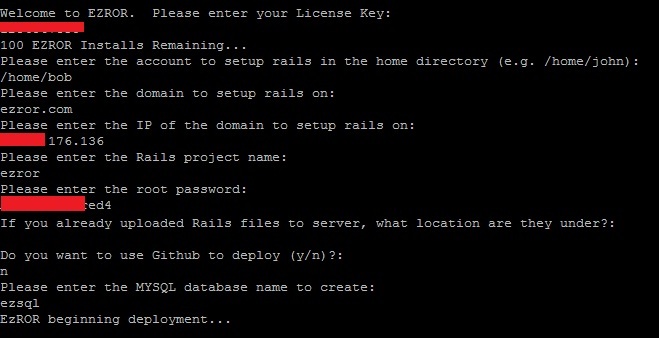 Ezror is the easy, simple way to install and configure everything you need to get your Rails app up and running. Simply run one command at your linux command prompt, enter in the required information and Ezror will take care of the rest. Automatically sets up and configures ruby, rails, rubygems, capistrano, git, passenger, apache, and mysql. Compatible with CentOS, Redhat, Debian, Ubuntu, Fedora, and SuSE distros of linux. Qweas is providing links to EZROR Easy Ruby on Rails Deployment 1.0 as a courtesy, and makes no representations regarding EZROR Easy Ruby on Rails Deployment or any other applications or any information related thereto. Any questions, complaints or claims regarding this application EZROR Easy Ruby on Rails Deployment 1.0 must be directed to the appropriate software vendor. You may click the publisher link of EZROR Easy Ruby on Rails Deployment on the top of this page to get more details about the vendor.